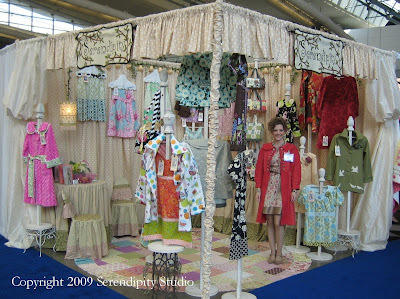 We are back from Pittsburgh where the Spring Quilt Market was held. We have never been to Pittsburgh before and weren't sure what to expect, but it was great! It only rained a little bit one evening and the weather was otherwise fantastic. We visited with a lot of shops and designers and I have to say that our industry is doing well, despite the gloom and doom you will hear these days. We are all grateful for our wonderful customers and will continue to work hard to bring you the best designs as the year progresses. 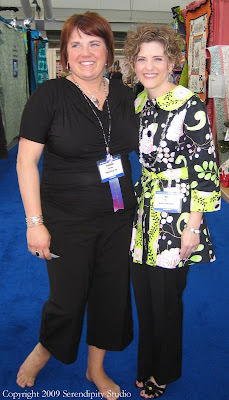 I met some great new people....probably not new to you in the blog world...Paula Prass and I finally met face to face after emailing each other since last market. She and her daughter are delightful, and of course, Paula is one of the great new fabric designers for Michael Miller. 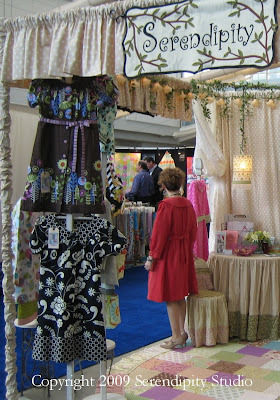 You will see some of her fabric in my booth if you look closely. She was premiering her new line Summer Soiree at market and everyone just loves it! Here is my Carmen Convertible Bag that I made with it. I am not sure when the line will be out, but it should be soon. We also met Trish Preston of Two Peas in a Pod. She was shopping ideas for a fabric line, so let's all keep our fingers crossed that good things will happen for her. She is so fun to talk to and has a great energy about her. Be sure to visit her blog and etsy store as well! Of course, we saw good friends from previous markets as well. We visited with Jona and Joey from Fabritopia (GREAT PEOPLE!! ), and Jona is just the best blogger ever....I aspire to be as dedicated as she is! 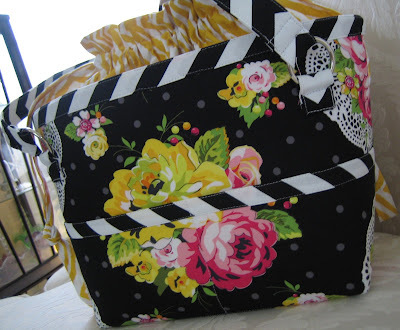 Check out the link to her blog on the right....Stop Staring and Start Sewing!. We also talked with Chelsea from Pink Fig and Lila Tueller, who designs fabric for Moda as well as having her own line of patterns. We also saw our friends Heidi and Roland from Quilt Home. They are just the best people....they have one of the best fabric websites out there, so be sure to check them out. 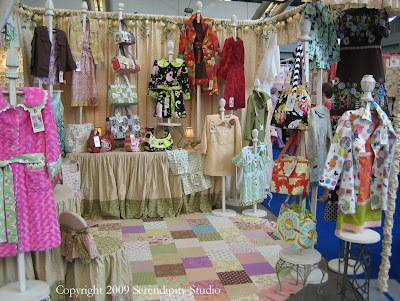 They always have the latest and greatest in fabrics, including all of those wonderful home decorating fabrics that make for wonderful jackets, I might add....keep them in mind when you get ready to shop! 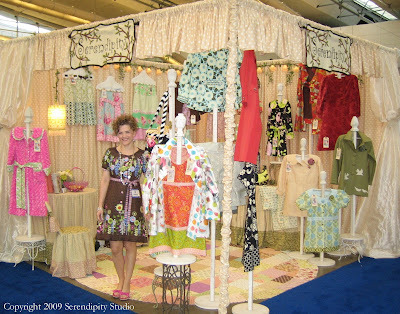 I am including some photos from market from each day...so you can see what I wore and how the booth looked. This is my outfit from Day #1. I am wearing a version of the Catherine Coat. This one is featured in a new line of fabric from Moda, French General. It is a beautifully textured piece of fabric with a subtle red stripe. Everyone loved it! The tunic dress I am wearing is the Sabrina, also made from a print from the same line. I added some fabulous silk for its luxurious shine and texure. Notice the drawstring at the back waistline of the coat in the next photo. I am planning on offering the instructions for that on our Catherine Coat page as a downloadable pdf for anyone interested. This is my outfit for Day #2. It is the Olivia Dress and it is made from a great border print offered by Michael Miller called Pod Posey. I love how you can play around with border prints and get this nice effect! Notice my shoes in the second photo.....someone actually took a photo of my feet with me standing on my floor quilt, so don't be surprised if you see them somewhere!! We had a great time in Pittsburgh....good food, and terrific markets in the Strip District. Be sure to check it out if you are ever there. I wish I could shop at those markets on a regular basis, but the commute from there to Texas is a bit much!